The D40 will deliver come what may no matter how noisy, crowded and sweaty the stage is. Solidly built so should give years of service and excellent sound reproduction. Doesn't enhance the sound much. 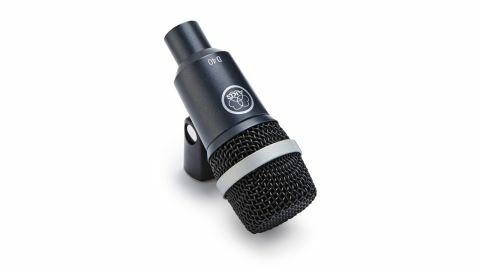 Compared to the recently reviewed AKG D12 VR - a mic as at home in the studio as the live arena - the diminutive D40 is a bulletproof workhorse built primarily for stage use. "The D40 has been built to capture an instrument faithfully in the sonic equivalent of a war zone"
The D40 is a compact and unpretentious dynamic mic that has been designed to withstand nightly abuse. Described by AKG itself as being suitable for 'rough stage use' it is equipped with a protective metal casing and grille and has a built-in windscreen/pop filter. A frequency range of 50Hz to 20kHz and a maximum SPL of 156dB enables it to be placed in front of all manner of instruments. We test the mic on drums in a studio setting, but the D40 has been built to capture an instrument faithfully in the sonic equivalent of a war zone. Placed over a snare and then each of our toms it certainly provides a healthy signal with no loss in frequencies. At the same time it does little to enhance the sound - not an issue in a live setting, but in the hallowed confines of the studio it's hard to get excited about it. This is a mic definitely more suited to its intended environment.